My girl whelped early. It was early, but it was not a surprise as she was very big and was carrying too many pups for her size. 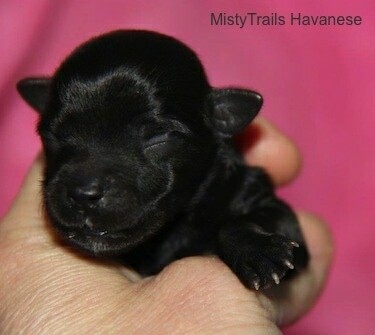 I usually start taking the dam's temperature on day 56 and hers was 98.5 F. This meant we were having pups in 12 hours! This was a bit of a surprise. I thought hmmmm, no they cannot be due yet, but it was a huge litter so maybe they really were coming. Taking the dog's temperature is a reliable method for knowing when the pups will arrive. I began preparing just in case. I never left her unattended and sure enough just like clockwork, within 12 hours we were having puppies. 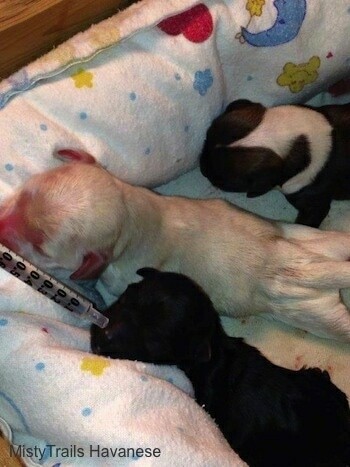 The puppies were born on day 56. On day 54 puppies have no sucking instict and rarely survive. The 2 days from day 54 to day 56 make a huge difference. It is like a human baby. If the baby is born after 36 weeks it doesn't need to be tube fed as the sucking instinct is there. 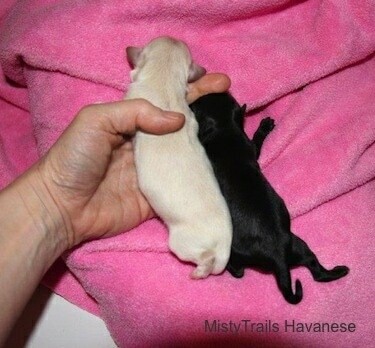 The pups were coming at midnight on a holiday weekend, which was not good timing. 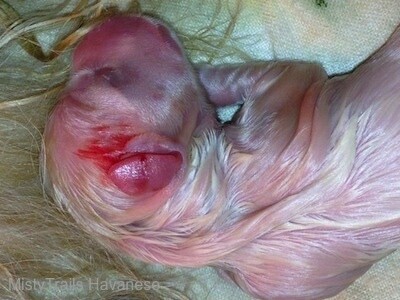 The first puppy was born healthy. Then things started to go wrong. 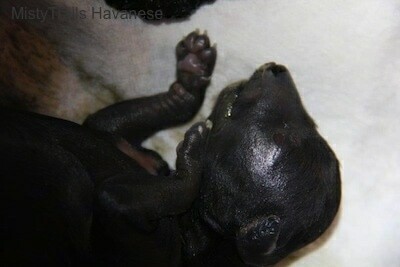 The second pup was born dead. It had been decaying for a few days. It was good I was present, so that I could take the puppy away. The mom would have tried to revive it and she would have eaten a decomposing placenta, which would have made her quite sick. 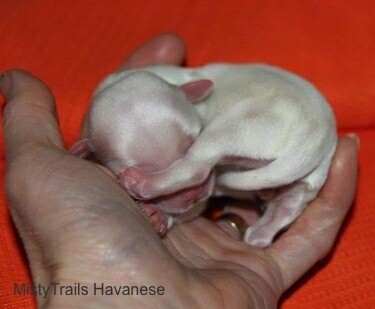 The third puppy was born healthy. 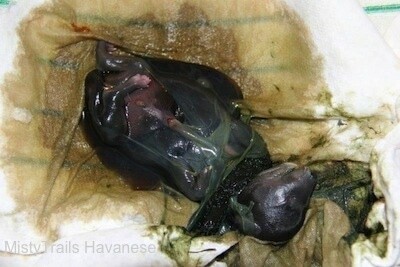 The fourth puppy was born dead and decaying. I never had this happen to one of my litters before, but it is not uncommon. 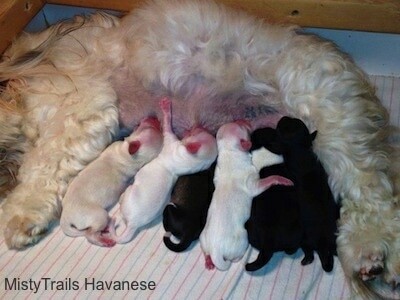 The fifth puppy was black in color and the sixth puppy was white. They were both severely dehydrated and in critical condition. I immediately, slowly dropped 1cc of water into them every 5 minutes. I was able to get 3cc of water in them. They were weak and fading. I supplemented them for the first 24 hours. They are now doing well. Without human intervention they would have died. They were born without nice blood filled umbilical cords and I am assuming they also had detaching placentas. Perhaps the placentas had stopped working that day. Thankfully they came early. You can tell if a puppy is dehydrated by pinching the skin on the withers, it should not hold the pinched position and should settle back in place. 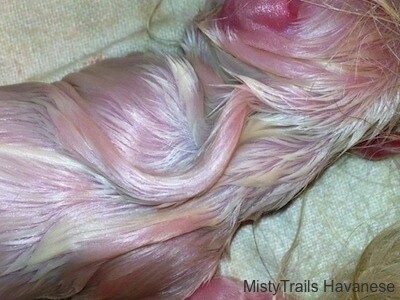 On the dehydrated puppies when you pinched the skin on the withers the skin just stayed ridged. 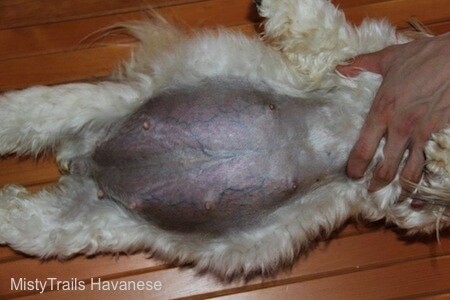 This picture and the picture above show how the puppy was dehydrated. You can see the protruding ridges in the skin. 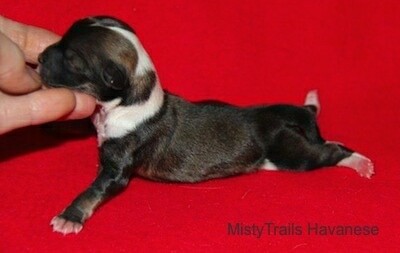 In a hydrated puppy the ridges would have dropped back to a smooth surface after being pinched. 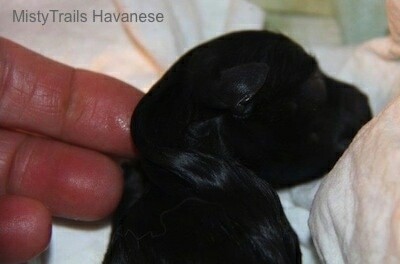 Two hours later puppy number seven and eight were born healthy. It was hard to wait the two hours, but all was good. Because the dam was a little early and had no milk I gave her a clean out shot of oxytosin. 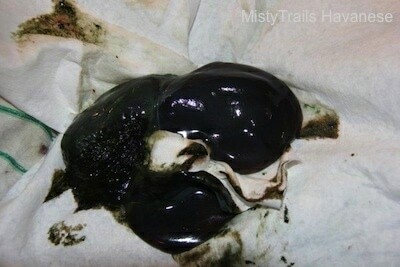 To top it off the dam started oozing green from her bottom. I think she could have had a retained placenta or another dead pup in there. It was Easter weekend and all vets were closed, but I had started her on antibiotics and she is well now. 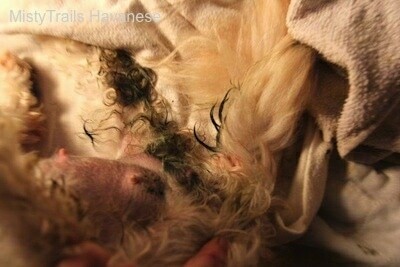 This green discharge that came out of the dam after the pups were born is the reason for putting her on antibiotics. We do not know the cause. 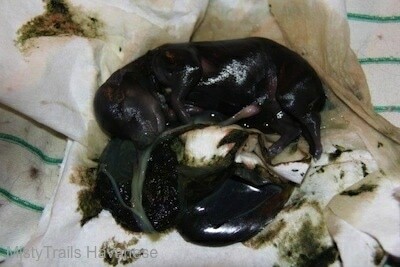 It could have been hormones or even lack of room inside the dam for such a large litter. 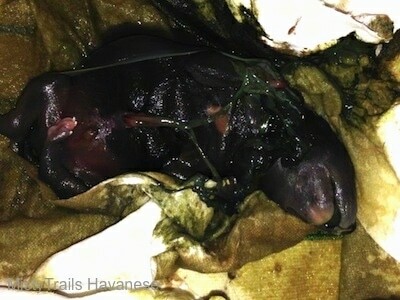 Two pups had detached several days ago and two more were detaching. Thank goodness I was home or those two dehydrated pups would have died for sure and the dam would have got very sick when she try to eat the two decaying pup's placentas. The surviving pups all sucking on their mother at one day old. They are all doing well. 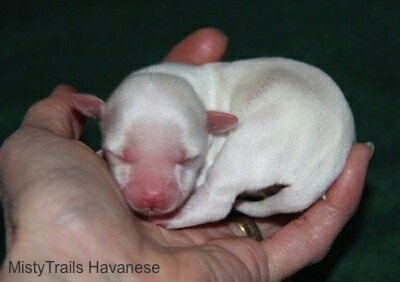 The 1st born puppy shown here at 3 days old. 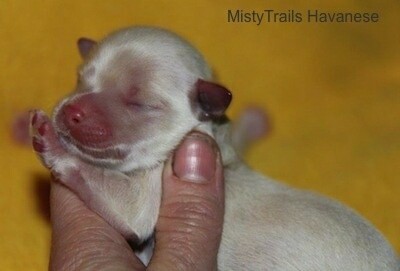 The 3rd born puppy at 3 days old doing well. Puppy number 5 now hydrated and doing well on day 3. 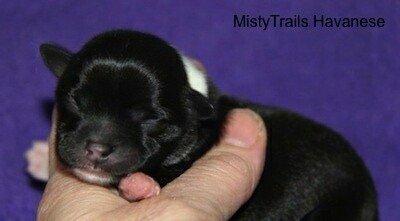 Puppy number 6 now hydrated and doing well on day 3. 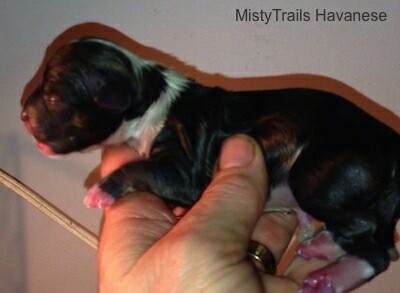 Puppy number 7 doing well on day 3. Puppy number 8 doing well on day 3.